President Donald Trump has called US intelligence agencies “naive” on Iran and also dismissed their assessment of the threat posed by North Korea. “Be careful of Iran. Perhaps Intelligence should go back to school!” Mr Trump tweeted. It also said that North Korea remained “unlikely to give up” its weapons stockpiles and production abilities. Last year, the US pulled out of the 2015 Iran nuclear deal, triggering widespread criticism from Washington’s allies. Mr Trump also launched a diplomatic push to improve relations with North Korea, meeting the country’s leader Kim Jong-un in Singapore last June to discuss denuclearisation of the Korean peninsula. What did Trump say about Iran? Iran, he continued, was “making trouble all over the Middle East, and beyond” in 2016, but had been “much different” since the US pullout from the “terrible” Iran nuclear deal. 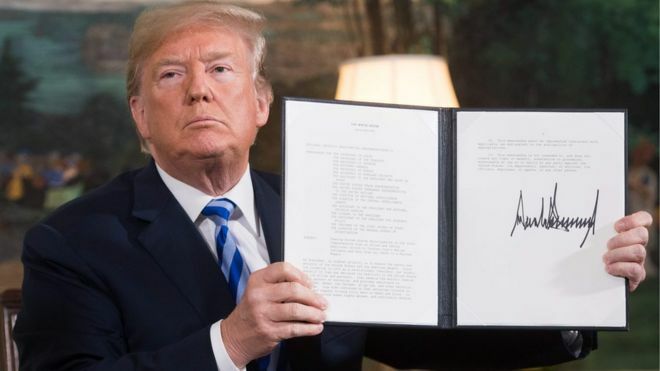 However, Mr Trump warned that Tehran remained “a source of potential danger and conflict”, referring to reported recent Iranian rocket tests. extremely passive and naive when it comes to the dangers of Iran. They are wrong! When I became President Iran was making trouble all over the Middle East, and beyond. Since ending the terrible Iran Nuclear Deal, they are MUCH different, but…. At the Senate hearing, CIA director Gina Haspel said Iran was “technically… in compliance” with the nuclear deal, despite the US withdrawal and the imposition of stricter sanctions against Tehran. However, the intelligence report warned that Iran’s “regional ambitions and improved military capabilities” would probably threaten US interests in the future. What about Trump’s remarks on North Korea? The president wrote that “time will tell what will happen with North Korea, but at the end of the previous administration, relationship was horrendous and very bad things were about to happen. The US intelligence report earlier concluded that North Korea was “unlikely to give up” its weapons stockpiles and production abilities while it tried to negotiate “partial denuclearisation steps to obtain key US and international concessions”. Having nuclear weapons was seen as “critical to regime survival”, the report added. In Singapore, Mr Trump and Mr Kim signed an agreement pledging to “work toward complete denuclearisation” – but there was no agreed pathway and little progress has been made since then on the issue. Yet these days a gaping chasm between President Trump and the heads of his intelligence agencies has almost become a new normal. The willingness of Donald Trump to attack intelligence assessments began after his election and before he took office, when the intelligence community at the tail end of the Obama administration produced an assessment that said Russia had interfered in the 2016 election. Rather than see the legitimacy of his victory undermined, he targeted the credibility of the spies. That trend has continued in office even with intelligence chiefs who now serve at his pleasure. They have to tread a thorny path (easier walked together than alone) between being seen to maintain their integrity in telling “truth to power”, and not risking the wrath of a president which in turn could undermine their work. Is this the first time Trump has clashed with US intelligence bosses? Last year, Mr Trump faced a barrage of criticism from both Democrats and Republicans after he defended Russia over claims it meddled in the 2016 US presidential elections. But after face-to-face talks with Russian President Vladimir Putin in Helsinki in July 2018, Mr Trump said there had been no reason for Russia to interfere. “President Putin says it’s not Russia. I don’t see any reason why it would be,” Mr Trump told a news conference. Just 24 hours later, the US president said he misspoke and should have said, “I don’t see any reason why it wouldn’t be” Russia. US special counsel Robert Mueller is continuing his investigation into alleged Russian collusion in the 2016 US election. President Trump has repeatedly described the investigation as a “witch-hunt”.